Two females charged with almost identical crimes but Rhonda and Claudia couldn't be more different if they tried; the prestigious ex-trophy wife meets the street smart, slick mouthed exdrug addict with hilarious consequence. A journey of two female prisoners as they explore friendship, addiction, motherhood and murder as old secrets and inner demons are brought to light. 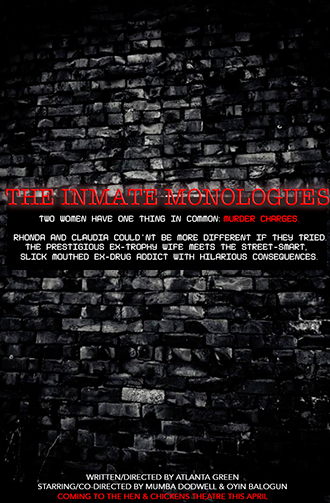 Rhonda and Claudia challenge the grey areas of being guilty VS innocent as they try to answer the key question: Is murder ever the right answer? A necessary and current conversation about modern society and contemporary attitudes to female criminals in the prison system. Atlanta Green is a promising up and coming black British playwright from South West London. At 24 years-old, Atlanta Green is a self published author; writing ‘Signed Sincerely, That Girl’ a collection of short stories and ‘Signed Sincerely, Those Words’ a collection of poetry; both available to download online via Amazon, and available to purchase in paper-back. Atlanta Green is also an established performance poet and performs regularly at poetry events as well as curating the ‘As Told By Her’ female only open mic poetry showcase. ‘As Told By Her’ was given a 6 month residency at The Dogstar Brixton venue in 2016 and hosted monthly female open mic and networking events.